The Parijat flower, also spelled “Paarijat” and “Paarijaata” is of a beautiful and mysterious plant whose flowers fall on the ground after blooming. The flowers bloom at night and drop down from the branches at the first rays of light, leaving us wanting for more. Parijat flower is known as Night-flowering Jasmine and Coral Jasmine worldwide. According to folklore, a princess “Parijataka”, who was in love with the Sun tried to win the heart of the Sun. When he rejected her, she committed suicide and a tree sprung from her ashes. Unable to stand the sight of her lover, the tree flowers only at night and sheds them like tear drops before the sun rises. Parijat flowers have four to eight petals arranged above a vibrant orange tube in a pinwheel pattern. These highly fragrant flowers open at night spreading their fragrance in the surrounding area with an intensely sweet floral aroma. These flowers blossom between August to December. Parijat grows in the outer Himalayas, and are found in tracts of Jammu & Kashmir, Nepal to East of Assam, Bengal, Tripura extended through the Central region up to Godavari in the South. Besides India, they are found in Thailand, Indonesia, Nepal and Pakistan. The tree is sometimes called the “tree of sorrow”, because the flowers lose their brightness during daytime; the scientific name arbor-tristis also means “sad tree”. The flowers can be used as a source of yellow dye for clothing. The flower is the official flower of the state of West Bengal, India, and for Kanchanaburi Province, Thailand. The juice of its leaves is bitter and saline in taste and provides effective relief in the treatment of several types of inflammation and fever including malaria, intermittent fever, common cough and cold. It also provides an assured remedy for various body disorders ranging from common cough and cold to arthritis and sciatica. The juice of its leaves when mixed with a little sugar is a good medicine for treatment of stomach ailments of children. In the treatment of skin diseases and constipation, the seeds of the Parijat tree are used. The plant is also useful for dyeing. The flowers can be used as a source of yellow dye for clothes. They are also used to make perfume owing to its rich aroma. The leaves are anti-bacterial, anti-inflammatory, anti-pyretic, anti-oxidative and anti-fungal. Its dried flowers and fried new leaves are used in several Assamese food recipes. The flowers are diuretic, anti-oxidative, anti-inflammatory and sedative. The flower oil is also very prominently used as a perfume. 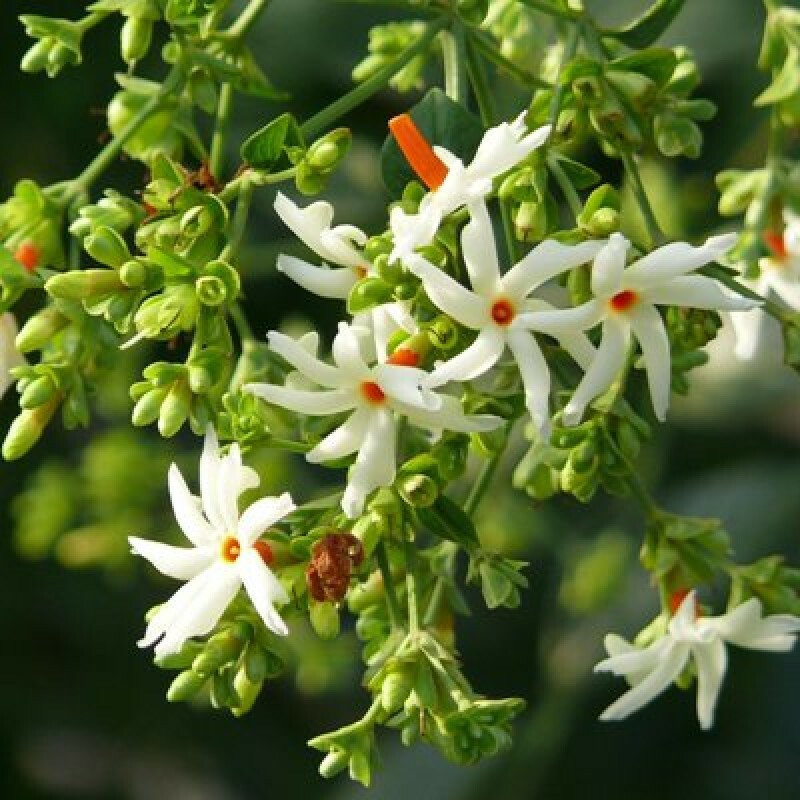 The flower has a very strong fragrance, hence is used for making incense sticks. The greatest enemy of this plant is standing water, which causes the roots to rot and die. Periodic deep watering, well rotted compost, and judicious pruning, is sufficient for this plant and is enough to make it bloom and make your garden beautiful and fragrant. Fertilising the plants once a year will be beneficial. The plant needs trimming as the shoots grow in different directions. It is better to grow the plant in the shaded area of the garden which receives a few hours of direct sunlight. Go and plant a Parijat tree and fill your house with intoxicating incense. Don’t forget to share your wonderful experiences with us. In botanical terms, Parijaat is known as Adansonia digitata and has been kept in a special category, because it does not produce either its fruit or its seeds, neither can its branch cuttings can be planted to reproduce a second Parijaat tree. This is a unisex male tree, the botanist say, that there is no such tree anywhere else to be found. The leaves of this tree in the lower portion has five tips like the fingers of a hand, while at the upper reaches it has seven. Its flower is very beautiful and white in colour, on drying out it takes on golden tinge. This flower has five petals. This tree blossoms very occasionally, with very few flower, but when it does, that is after the 'Ganga Dashehra', spreads its fragrance far and wide. The age of this tree is said to be 1000 to 5000 years. The perimeter of the trunk of this tree is around 50 feet and height of around 45 feet. Product (Rudraksha Plant or Tree) Information:Plant Height: 1.5- 3 feets. Pot size: 4.5/5 inch Dia and 4.5/5 inch Height. Kingdom: Plantae Division: Magoliophyta Class: Magnoliopsida Order: Oxalidales Family: Elaeocarpaceae Species: Elaeocarpus ganitrusDefinition and meaning of the word Rudraksh The word rudraksha is derived from two words - rudra (रुद्र) and aksha (अक्ष). A. Aksha means "Tear Drops". Rudra and aksha means the one who is capable of looking at and doing everythin..